1. Press the COAST/SET switch and hold it. While the switch is pressed, the vehicle speed will gradually decrease. 2. When the desired speed is obtained, release the COAST/SET switch. During cruise-speed driving with a manual transaxle vehicle, do not shift into neutral without depressing the clutch pedal, since the engine will be over-revved. 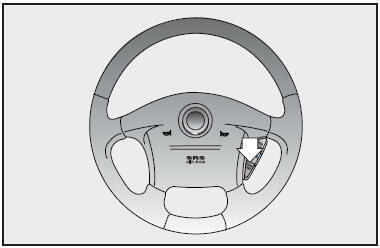 If this happens, depress the clutch pedal or release the main switch. During normal cruise control operation, when the set button is activated or reactivated after applying the brakes, the cruise control will energize after approximately 3 seconds. This delay is normal.